SOUTHAMPTON, England, March 31 - Marine engineers took the 81,237-ton steamship Queen Mary out to sea and deliberately rocked her as hard as they could. They said today that they had just about taken all the seasickness out of the luxury liner. After an overhaul costing $1,400,000, the Mary will resume her trips across the Atlantic Wednesday on the first real run with her new stabilizers. She is due in New York April 7. 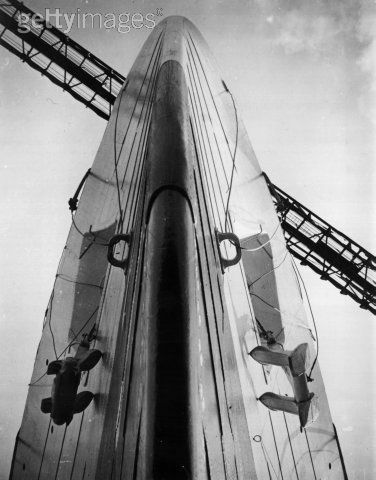 The designers predicted the ship will not roll more than 3 degrees - that is 1 1/2 degrees each way. The saving in smashed dishes alone should amount to thousands of dollars a year. In her 23 years at sea the Queen Mary has ploughed through some ferocious weather, and on occasion has rolled 30 degrees. 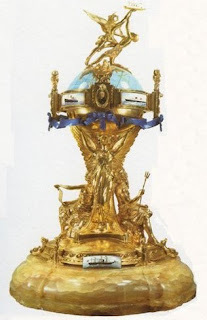 The big vessel was taken off Land's End for the trials yesterday, and astonished skippers of other craft reported there seemed to be a drunken driver at the wheel. The ship was made to roll, by erratic steering and by the twin stabilizers - two fin-like protuberances under the water on either side. Rolls of 9 degrees were attained and then, with adjustment of the stabilizers, the vessel was brought to an even keel within seconds. 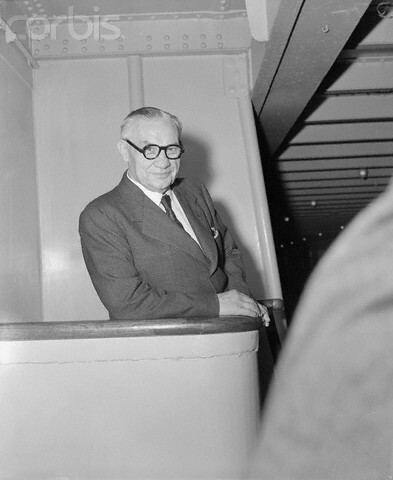 NEW YORK, March 30 (UP) - British Foreign Secretary Ernest Bevin, arriving today in this country to sign the North Atlantic Pact, was the target of a tomato. It was hurled from a group of jeering pickets today as he left the liner Queen Mary. The tomato missed its mark. The three youths were arrested on disorderly conduct charges after mounted police rode their horses onto the sidewalk to force the hooting crowd back. No one was hurt. Nearly 800 pickets, sponsored by the Joint Commission to combat Anti-Semitism, had marched before the pier at which the Queen Mary arrived. 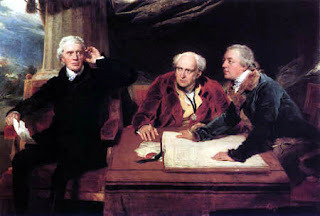 When the foreign secretary left the ship only about 30 remained. They said they were college students and that their picketing was "spontaneous" and unsponsored. "How do you spell Bevin? 'S.O.B.'" Several of the youths were roughed up in the clash with the policemen. A few of them reached the curb as Mr. Bevin's car passed. Police said some of the youths were carrying eggs but didn't throw them. Those arrested included Robert Newman, 19, a mail boy, Brooklyn, and Harry Hirsh, 17, Brooklyn, a student at Samuel Tilden High School. Police said others in the group identified themselves as students at New York colleges. Mr. Bevin said aboard ship that if the North Atlantic nations just "sign a pact and then stand back, we will be in great danger." "Do you mean the pact needs implementation?" He was asked. The British foreign secretary said the Atlantic Pact "has taught the world again that democracy can come together when danger is apparent." Andrei Gromyko, chief Soviet delegate to the United Nations, also arrived on the Queen Mary. "Did you have any conversations with Mr. Gromyko?" Secretary Bevin was asked. "I never disturb a ship and cause any danger," Mr. Bevin replied, smiling. Secretary Bevin on the Queen Mary in September 1950. London (C.P. 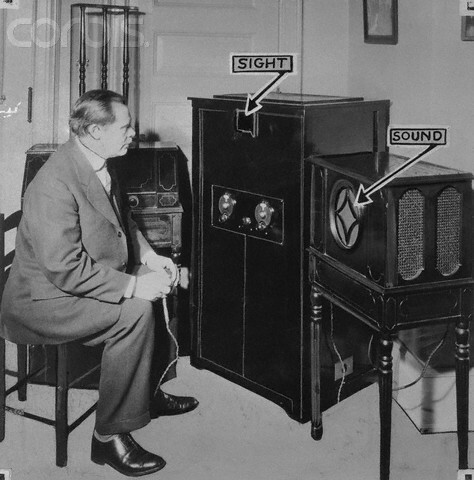 Cable) - The death of Baron Ashburton, a noted yachtsman, on the liner Queen Mary on Sunday was announced today. He was 71. 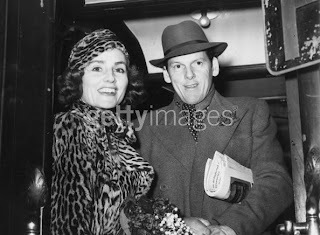 Returning from a two-months' visit to New York, he died of a heart attack, Lady Ashburton, the former Frances Donnelly, of New York, accompanied him. The liner docked at Southampton today. 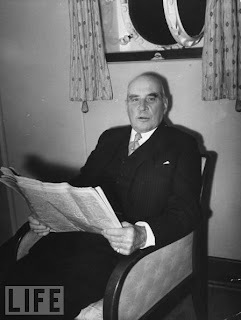 Lord Ashburton was a descendant of Sir Francis Baring, founder of the banking firm of Baring Brothers. One of his ancestors was Lord Ashburton who in 1842 negotiated with Daniel Webster the Ashburton treaty which ended the boundary dispute between Maine, New Brunswick and Quebec. The title went to Alexander F. Baring, a director of Baring Brothers and son of Lord Ashburton's first wife who was a daughter of Viscount Hood. 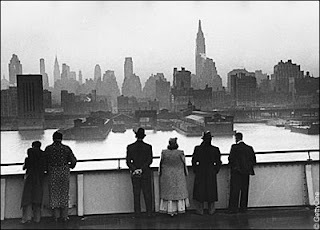 NEW YORK CITY - Refugee Liner Queen Mary sails down the Hudson River under sealed orders, a vessel of the King's navy. The intensified British patrol of the Skagerrak-Kattegat outlet from the Baltic to the North Sea has a more important purpose than any mere tightening of the economic net about Germany. 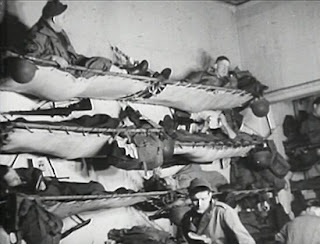 By sending the huge liners Queen Mary and Mauretania to sea, the British threw down a sharp challenge to nazi daring. And the British believe that it was through neutral Scandinavian waters fringing Skagerrak and Kattegat--Danish on one side, Swedish and Norwegian on the other--that the only two German surface sea-raiders of this war stole out to rove the Atlantic. Closing the main door to the Baltic against egress of a nazi pocket battleship or swift cruiser to hunt distant seas for the two British merchant queens probably is the major British purpose in probing Danish and Norwegian coastal contours with submarines and small surface craft. The sinking, or driving ashore, of a few small German cargo craft is a far less important matter than baring that road for a nazi successor to the scuttled Graf Spee or the less successful Deutschland. NEW YORK. - (AP) - J.P. Morgan was as talkative as usual when he sailed in the Queen Mary yesterday for a spring vacation at his London home. Politics - Nothing to say. James J. Hines' conviction - Not interested. Morgan did say that it did not "necessarily follow" that his going to Europe at this time meant that he believed there might be no war. He said he was going for the purpose of mapping a trip on his palatial yacht Corsair, recommissioned in February. NEW YORK, March 24. - The first group of British factory workers being sent here by the ECA to compare manufacturing processes, sailed from Southhampton [sic] this week on the Queen Mary. 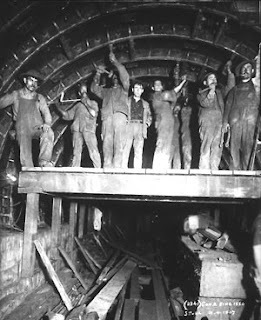 Leonard Ray, a 58-year-old foundry worker, was among them, and this was his first time aboard a ship. When he boarded the Queen Mary a guided offered to show him around the vessel. But Ray already knew what he wanted to see first: he headed directly to the prow of the ship, and stared in admiration at the anchor. "Does an anchor fascinate you?" the foundry worker was asked..."This one does," he said. "I cast it." 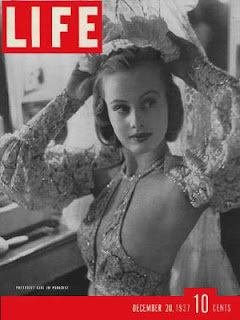 NEW YORK, March 23 - Hope Chandler, one of Broadway's prettiest nightclub entertainers, and David Whitemire Hearst, 21-year-old son of publisher William Randolph Hearst, were married today in Grace Church,where the bridegroom's father and mother were married 35 years ago. 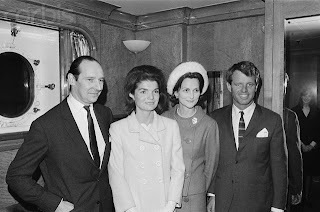 After the wedding, Mr. and Mrs. Samuel Coley, the bride's stepfather and mother, gave an informal reception aboard the Queen Mary, on which the couple will go to Europe for a six weeks' honeymoon in London and Paris. Mr. and Mrs. Hearst will live in Baltimore, Md., where he is employed by the Baltimore News, one of his father's newspapers. Reports were current in New York to-day that the British liner Queen Mary, which was said to have been sighted off the New Jersey coast yesterday, is heading for Bermuda. 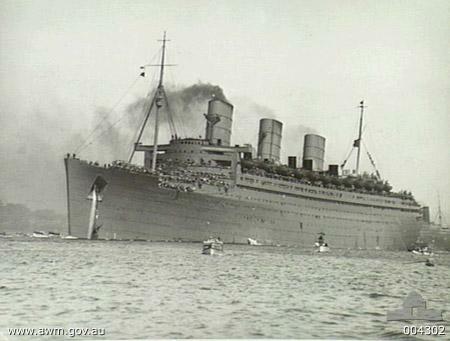 The Queen Mary put to sea yesterday morning a few hours after the Mauretania had sailed. There has been no news of the Mauretania since her departure. Seamen had thought that both liners would head for Halifax (Nova Scotia) to take aboard defensive armament before sailing for Australia via Cape Horn to act as transport ships for ANZAC troops bound for the war zones. 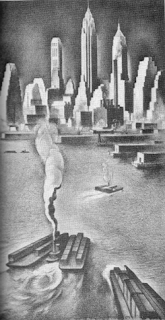 The Queen Mary is reported to be carrying enough supplies for a three months' voyage. The s.s. Berkshire, which arrived in Boston from Baltimore to-day, reported that she had passed the Queen Mary at midday on Thursday off the New Jersey coast. The seamen said the Queen Mary was proceeding in a south-easterly direction, traveling at a "terrific speed," which they estimated at 35 knots. - Associated Press and Exchange Telegraph. 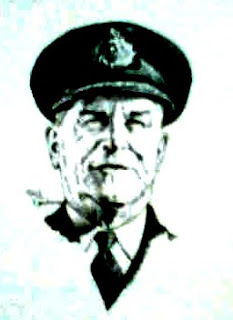 Captain George Gibbons...has been appointed "second captain" of the Queen Mary. He will be in joint control of the ship with Captain Sir Edgar Britten, her commander. Captain Gibbons was recently master of the Majestic. 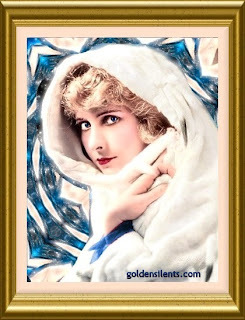 Back to Europe tourist class on the Queen Mary, after a few months spent practically incognito in the U. S., sailed the Dame and Seigneur of Sark (Mrs. & Mr. Robert Woodward Hathaway*). 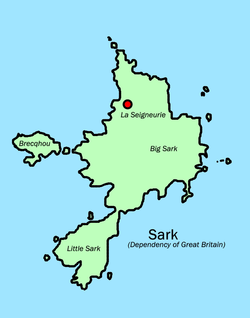 Their realm: a tiny Channel island of 600 people, smallest self-governing state of the British Empire, which was chartered in 1565 by Queen Elizabeth and has never had automobiles, politics, divorces, income taxes or crime waves. 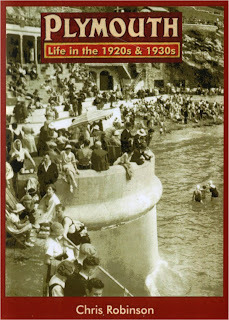 Said the Dame of Sark: "The last crime trouble we had was several years ago, when a 14-year-old girl ran off with some article from a clothesline. We told her not to do it again. There is a little jail, but I suppose it would be rather hard to get the door open now." NEW YORK - (AP) - Secret preparations to make Australian troop transports of Britain's 81,000-ton liner Queen Mary and its 35,000-ton new Mauretania were under way here last night. Both opulently built for the luxury trans-Atlantic trade of peacetime, they have been lying here idle under dirty gray camouflage paint, the Queen Mary since the outbreak of the war and the Mauretania for some three months. 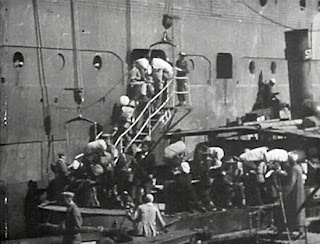 The British admiralty's decision to put them in the troop service was not made known officially, but the intention was disclosed with the arrival late in the day, aboard the British steamer Antonia, of 770 officers and men to supplement the skeleton crews which have been manning the Mary and Mauretania at their quiet piers. (In London, the admiralty would not comment). "If the ships are to be placed in service as Australian troopships you could hardly expect us to admit it at this time." United States customs said, however, that because of information that the Britishers would be transferred by today to the Queen Mary and Mauretania it had not been necessary to inspect their baggage. No information was available as to when the vessels might leave, but the circumstances suggested a departure within a month. Their route could and probably will take them out of the path of German danger - through the Panama canal or alternatively around the Cape of Good Hope, through the Pacific and Indian ocean waters to Australia. A little more than a month ago - on Feb. 12 - the British landed at Suez, Egypt, a great army of New Zealanders and Australians. 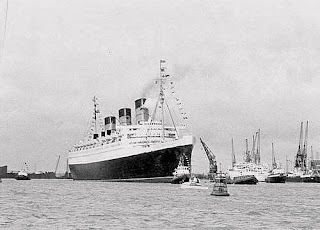 The departure of the $25,000,000 Mary, and the less showy but newer Mauretania would leave here the biggest of all merchant vessels - the 85,000,000-ton Queen Elizabeth, a $27,500,000 British investment which reached here on March 7 after running the gantlet of the north Atlantic on a strange maiden voyage. The Mary was at sea when Britain declared war last September 3 and upon her arrival here the following day she was moored - ostensibly "for the duration." New York, March 15 - (AP) - Gang rivalry for control of labor on the new city docks now used by the French liner Normandie and being completed for the British liner liner [sic] Queen Mary, was blamed by police tonight for an early morning street shooting in which three men were wounded, one fatally. Police attributed the shooting to a longshoreman's feud. Lord and Lady Plunkett [pictured at Waterloo Station] are arriving Monday for a few days' visit with her mother, Miss Fannie Ward, and her husband, Mr. Jack Dean. They will leave the latter part of the week for New York to sail on March 24 on the Queen Mary for the coronation ceremony. 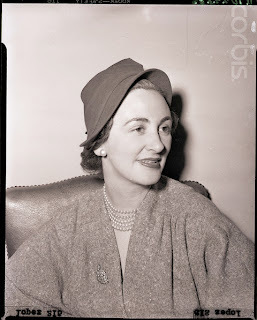 Arriving in New York on the Queen Mary this day in 1953: Irish fashion designer Sybil Connelly (pictured shipboard, modeling one of her hats). A LIMITED QUANTITY TO ARRIVE NEXT WEEK on the QUEEN MARY! 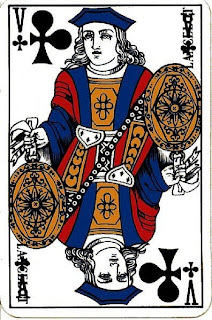 All America will be playing the new bridge game with the "Royals" - the new extra suit with the green crown symbol. There are 65 cards in the new deck - each player is dealt 16 cards instead of 13! The quantity will be limited, so order yours today to avoid disappointment. Miss Elizabeth Irving Chase arrived yesterday to be the guest of her mother, Mrs. Irving Hall Chase, at El Palmar for the remainder of the season. 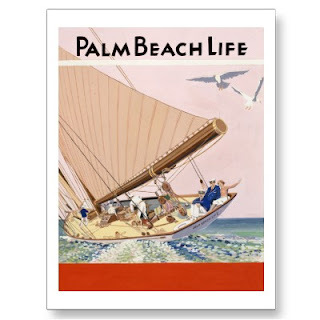 She arrived in New York on Monday from England aboard the Queen Mary and came to Palm Beach immediately. Commander and Mrs. Warden Gilchrist are also members of the house party. Hackensack, N.J., March 9 - AP - A New York gun dealer, identified by Prosecutor John J. Breslin Jr. as Moe Saraga, was held without bail today as a material witness in the killing of R. Norman Redwood, New York "sandhog" union leader. Breslin said Saraga was the last known possessor of one of the pistols used to kill Redwood in front of his Teaneck home, Feb. 19. 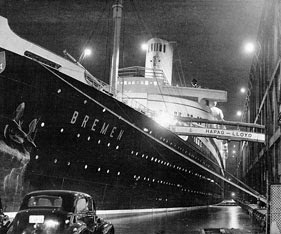 He was taken off the Queen Mary when it docked in New York early today, Breslin said, was rushed to the Wadsworth avenue [sic] police station - New York headquarters of the special police bureau set up to find the Redwood killers - and then brought to Hackensack. Miss Effie Burton, who has been visiting her parents, Mr. and Mrs. R. E. Burton on University Avenue, left last week for Chicago and will go from there to New York where she will sail on the "Queen Mary" for a trip to Europe. She will visit with an uncle and aunt in Dublin, Ireland. Miss Burton is a concert singer and has several engagements to sing abroad. After her tour, she will return home to Berkeley to make her home. Two University lads broke into the heavily guarded dockyard here and walked off casually with the flags of the liner Queen Mary. Recently 13 Manchester U students nailed a Soviet banner atop the 250-foot tower of Britain's Calder Hall atomic power station. "The Viscountess Hardinge, who has been in Ottawa for several weeks, staying with her mother, Mrs. Hugh Fleming, left today for New York, and will sail for England by the Queen Mary." 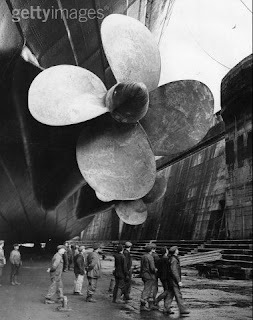 SEE BRITISH UNABLE TO BUILD BREMEN RIVAL; Shippers Say Construction Cost of 50,000-Ton Ships Would Prohibit Investment. 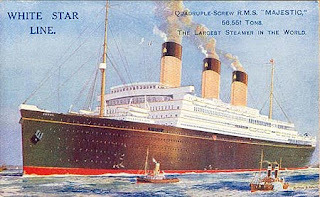 "According to advices received yesterday from London, there is no likelihood of the White Star or the Cunard steamship company contracting to build a liner of 50,000 tons or over to beat the North German Lloyd record held by the Bremen since last Summer."